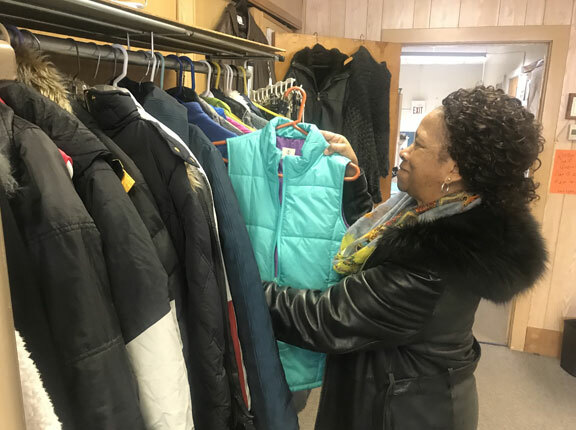 NAUGATUCK — Winter will be a bit warmer for a couple dozen people who attended the United Methodist Church’s annual winter coat collection and giveaway on Saturday. Ethel Grant, the church’s mission chairwoman, said the event started when members of the church saw a need. By 11:30 a.m., Saturday about 25 people collected winter items, such as coats, hats, scarves, gloves, sweaters and even blankets. Donations started coming in at the beginning of this month and about 50 people donated gently worn winter clothing and garments. Dawn Mudry, the church’s Sunday School superintendent, said when doors opened Saturday morning, the first couple to enter said they are homeless. “To know that we were able to give them clothes, hats, gloves and coats, this is why I continue to do this every year,” Mudry said. After Saturday’s collection and giveaway, the church will give a portion of leftover items to homeless shelters and the remainder will be available inside the church’s thrift shop, where anyone in need can collect items throughout the season. Pastor Peola C. Hicks said she is hoping people come to know the love of Jesus through the generosity of the church.